There are a number of ways to change this recipe with different fill-ins. All of them very tasty. This is a weighed out, exact recipe from King Arthur that provides a lightly spiced and chewy oatmeal cookie. You can add various chocolate chips, dried fruits and nuts to it and still taste delicious. The method is simple and doesn’t require sifting or another bowl if you weigh the flour and oats in the mixing bowl. No scale? Once you get it you’ll wonder how you ever cooked without it. Or myabe I’m just easy to please. 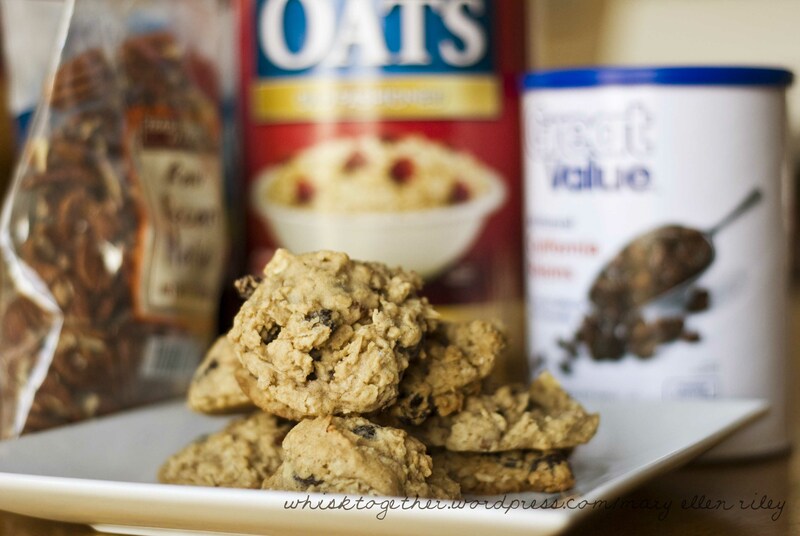 There is a previous oatmeal raisin cookie recipe on here. The recipe is very popular on Tasty Kitchen. It tastes great with dark brown sugar and has a nice depth of flavor. I like them both! This recipe works well cut in half as well. I make these with pecans and raisins. **Update** I’ve made these 4 times now and the last time I froze the dough. The cookies did NOT turn out as well. They ended up really dark brown on the outside and still soft and gooey on the inside. I wouldn’t recommend it. The ginger taste is also very very powerful in the cookie dough frozen state. You don’t taste it much when you first make the dough, or even when you bake the cookies, but it is really powerful eating the frozen dough! 1. Mix together with the paddle attachment: butter through vanilla ingredients. Mix about a minute or two until thoroughly combined and creamy. 2. Add eggs one at a time and thoroughly combine before adding the next. (This is called creating an emulsion (Thanks Alton Brown)). 3. Add the apple juice/boiled cider/dark corn syrup and incorporate. 4. On low speed, stir in the fruit and nuts. 5. On low still, add the flour, then the oats. Stop when the oats are incorporated. 6. It usually helps any dough to refrigerate it for about an hour to help scoop and retain its shape while cooking. I put it in for about 1 hour. 2 might be better, but I want cookies! 7. Preheat oven to 350 degrees. Scoop using a medium cookie scoop (which is 1 Tbs. of dough) and bake for 10-13 minutes. Some of mine browned fast after 12 minutes, so I say check after 10 minutes. Feel free to make monster cookies with this too and bake about 15 minutes. Once they begin to just barely brown on the edges, remove and place on a cooling rack to cool.